Capsule Summary: Radar starts to worry when Colonel Potter takes an interest in a visiting female colonel. Meanwhile, Hawkeye becomes obsessed with learning what B.J.’s initials stand for. And Margaret thinks about her future in the Army. This episode features three distinct plotlines, two of which involve the title character. The A story is the friendship (and almost more) between Colonel Potter and Colonel Lillian Rayburn. The B story is Hawkeye trying to get B.J. to reveal the meaning of his name. Finally, there’s a minor C story about Margaret. Am I the only one who thinks Radar should mind his own business? I suppose some may call it sweet how Radar is so protective of Colonel Potter. But Sherman Potter is no Henry Blake. Out of everyone at the 4077th, Radar should know there’s no way Potter will cheat on his wife. Hawkeye hit the nail on the head: Colonel Potter just wants to talk to someone his own age. Also, why does Radar get suspicious so quickly? Colonel Potter volunteering to show Colonel Rayburn around the 4077th doesn’t seem all that unusual. Maybe Radar’s “radar” picked up on something. I do feel a little bad for him. His suspicions are seemingly confirmed by Margaret and Klinger but, in my opinion, the two are joking with Radar, swapping innuendo and suggestions that only make him more concerned. Hawkeye’s obsession with learning what B.J. stands for is hilarious. The scene in Colonel Potter’s office when Hawkeye’s interest is piqued is well done. Hawkeye and B.J. have a conversation about B.J.’s name in the background while Colonels Potter and Rayburn talk in the foreground. 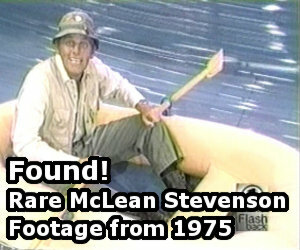 Viewers watching this episode back in 1978 didn’t have the option of rewinding the scene to catch both conversations. Blink and you’ll miss Margaret’s C story. It consists of a brief conversation between Margaret and Rayburn plus an even briefer followup in the Officers’ Club. At first, Margaret just seems (over)eager to please her superior during an inspection. Only later is it clear Margaret sees herself in Colonel Rayburn and she wants to know whether the older woman worries about being alone. Rayburn reassures Margaret and Margaret, in turn, tries to pass on that reassurance to Klinger. Colonel Potter realizes Lil is interested in more than friendship. Anyone know what the machine Charles asks Father Mulchay to move does? Blood transfusion? Oxygen? This episode takes place around September 10th. Klinger mentions the date while talking to Margaret in the Officers’ Club. Jennifer Davis has a line of dialogue in the opening scene but is uncredited. Whoever plays Colonel Rayburn’s driver also has a line of dialogue and also isn’t credited. Hawkeye makes two guesses about B.J.’s name. Which is better? Belvedere Jehoshaphat or Benito Juarez? I wonder if scriptwriter Sheldon Bull came up with additional guesses that didn’t get used. Radar yells at the unseen voice on the PA system. It may be the only interaction between one of the characters and the mysterious announcer–this episode, Sal Viscuso. Radar has been known to see both Colonels as his father figures, but I think this episode serves as evidence that he eventually grew closer to Potter than he did Henry. 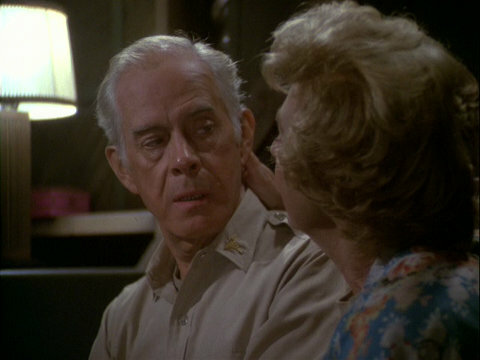 In “Henry in Love,” Radar kind of looks the other way regarding Henry being in love with Nancy Sue Parker – and in fact, pretty much Henry’s affair with Leslie Scorch throughout the first season as well – though he did patch through that call to Lorraine to remind Henry who is real love was. In “Lil,” however, Radar is not only so furious over the idea of Potter possibly cheating on Mildred, but he also takes it personally, like perhaps a kid would if he found out his father had been cheating on his mother and is now wanting a divorce. Some suggest that Potter became Radar’s truer father figure, and Henry was more like an older brother. I’ve read that BJ was named for M*A*S*H Director of Photography William “Bill” Jurgensen, aka “BJ” to those on set. Yup, the writers had a tendancy to name characters after people they knew in real life – Ken Levine was especially notorious for this, such two of Radar’s love interests (Linda Nugent in “Hot Lips is Back in Town” and Patty Haven in “Good-bye, Radar”) being named after ex girlfriends of his. Sherman Potter was supposedly named after an old doctor of Larry Gelbart’s. Some have even speculated that the name Adam’s Ribs came from Gelbart’s son Adam, but I’m certain it was a nod to the Book of Genesis in that God created Eve by taking one of . . . Adam’s ribs. Personally, I think B.J. was joking about being named after his parents Bea and Jay. The conversation between Margaret and Lil piques my interest, especially Margaret’s remark about her marriage, “I was, but he wasn’t”. I don’t think that makes any sense at all. Can someone clarify it in any way? I took it to mean Margaret feels she was married (and faithful) but her husband never thought of himself as a married man. I agree, RJ….that the commitment was there from Margaret, but it wasn’t there much at all from Donald. She was more committed to the marriage than Donald was. How could B.J. not tell the Army his full name? As far as Radar goes, he seems a bit needy here. Potter voiced his frustration with not having anybody his own age to talk to in “The Interview” so it’s not like Radar wouldn’t have understood. Totally agree. I think it was partly his jealousy over Potter spending time with someone that’s not him and mostly his worry that “dad” would cheat on “mom.” He was beyond annoying with his attempts to stop them from spending time together. He should have trusted Potter to do the right thing. It was insulting to Potter how antsy he got over it. I have always loved the exchange in the Swamp where for one of the few times Charles and BJ gang up on Hawkeye. Chalres chiming in with “Favorite Writer S.J. Perlman” is classic and the timing is great. This is a good season 7 episode. The Lil character was one of the few likable visiting officers in the series, although her attempted seduction of “Sherm” always kind of creeped me out. Radar’s suspicions were definitely over the top. He should have known that Potter would never mess around with another woman. I like the scene in the O-club with Margaret and Klinger (and then Radar). It’s a rare moment of pleasantness from Margaret. The BJ’s name subplot is slight but it provides some of the best laughs of the episode. I agree that the scene in the swamp between BJ, Hawkeye, and Charles is probably the comedic highlight of the episode. Wonder if Mike Farrell asked “what’s the BJ stand for?” When he was first presented with the character by the writers/producers. Was Hawkeye’s “Hey, Buffalo Bob” a mistake? Could Hawk be familiar with “Howdy Doody” at this estimated point of the war? Love this episode. It warmed my heart to see how happy Potter was to have someone his own age to talk with. I imagine Harry Morgan felt the same as he’s working with a younger cast and crew all the time. B.J. is my favorite character, and though knowing he was probably named after a crew member appeases me a bit, it always drove me crazy that we never truly get to learn what ignore stands for in the canon of the show. That’s why my little guess / notion in my head is his name is Benjamin John, and he never told anyone at first because he didn’t want to get confused with Hawkeye, and then later just to mess with him / not give him the satisfaction of knowing he shares a name with him and Trapper (though they never met). Definitely not true but it makes me laugh when I think about it. We do learn in the show. He was named for his parents, B Hunnicutt and J Hunnicutt. The only thing we don’t really learn is if his parents names were actually pronounced like B and J, so something like Bea and Jay, or if he was just using the initials of their first names to show how he got his. Either way, I think the point is that his actual name is BJ, and it doesn’t stand for anything.